Full Circle is a great store downtown Victoria offering awesome gifts, supporting local artists and fair trade initiatives, and you can find affordable jewellery, clothing, yoga pants, teas, candles, incense, prayer flags.... Always fun to browse and relax the soul. I went to Full Circle last week for a book signing of Joseph's newest book "Living in Two Worlds – a Life of Love", his autobiography. I have known Joseph for years and he is an amazing speaker capturing his audience with his knowledge, having studied the human psyche all his life and passing on his anthropologic knowledge. 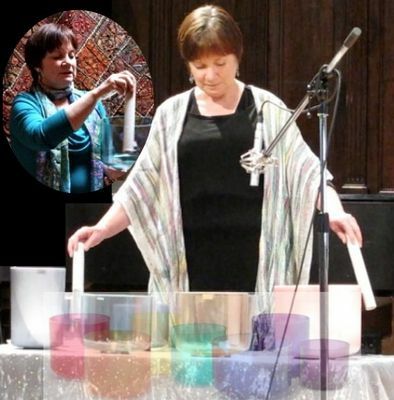 Sound healer Nancy Watters performed a Crystal Bowl and Mantra mini concert and a sound therapy demonstration. It was a truly magical experience, connecting everybody in the room. I was amazed how light the crystal bowls were, for some reason I thought they ought to be heavy. I met friends that I didn't expect at that event and when I left I felt at ease, happy, and relaxed. A wonderful week night experience.